Simon Beck has spent a lot of time at Arc2000 in the French Alps this winter, but he hasn't been skiing. 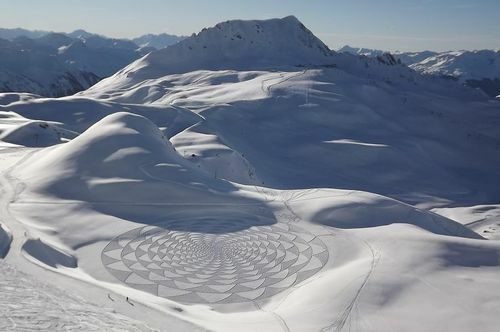 Beck spends his days doing something entirely different: making snow art. Many compare Beck's work to "crop circles," but this is not the labor of "aliens" who've chosen a wintrier medium. 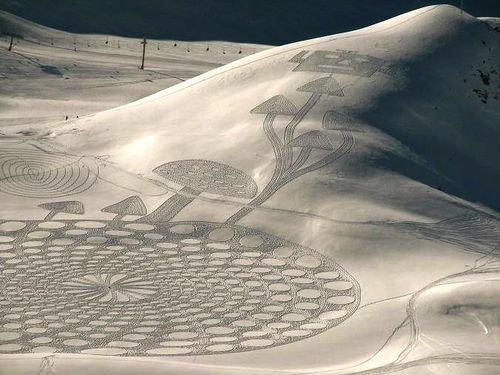 This "snow art" is the work of a lone artist who spends hours trudging around the French ski resort to fashion his designs. Beck's intricate creations come in a range of forms from spirals to cubes, snowflakes, and abstract figures. 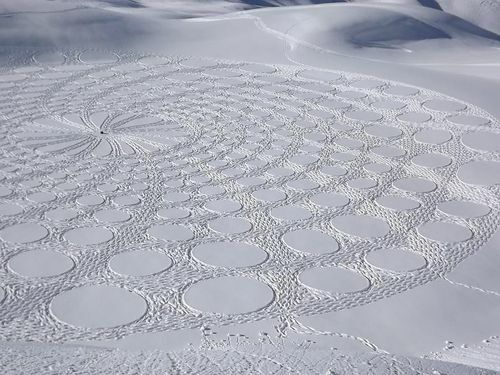 These snowy "crop circles" are created by the simple act of walking in the snow wearing raquettes. 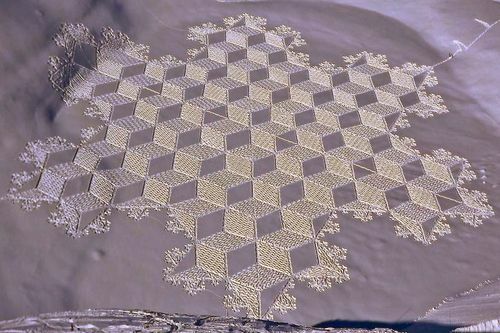 "They aren't hard to do," Beck boasts on his snow art page. "Good exercise, yes, but not particularly difficult. I've placed it in the walking category as they are made by walking about in snowshoes." The Oxford-educated self-employed map maker typically walks for about five hours or until he gets too tired, using a headlamp if it gets dark first. The shapes are created by a kind of reverse orienteering. The main lines and points are surveyed using a sighting compass with distances measured either by pace counting or string. "The main reason for making them was because I can no longer run properly due to problems with my feet, so plodding about on level snow is the least painful way of getting exercise," Beck said. "Gradually the reason has become photographing them." Thank you so much for sharing this, they are beautiful, and I agree…a great way to keep up with your exercise and have some fun too.